Innovations in dental technology have made a trip to the dentist’s office an entirely new experience thanks to a relatively new field called cosmetic dentistry. The smile is our window to the world, and it’s the first thing that makes an impression on people we meet. So it’s no wonder that more and more people are turning to cosmetic dentistry for corrective procedures and aesthetic enhancement. So whether you want to fix a chipped tooth or get a complete smile makeover, we can help you achieve the smile you’ve always wanted. We doesn’t just recognize that customizing attention for each tooth makes the overall difference to your individuality. He is also fully aware that you have other considerations when you visit the dentist. These might include fitting finances to the dental procedure option that is best for you. Let us give you your dream smile! When you give him your vision, he will convert that into reality by accommodating an achievable treatment plan within your particular financial boundaries. Whatever your dental concerns may be, we have a procedure that will provide an answer. It could be dentures that you need. It may even be a combination of solutions that include implant restorations, veneers, bridges, crown, tooth colored composite bonding, or teeth whitening. Whatever the requirement, we are skilled and ready to perform wonders with your smile. When teeth are sparkling white, you tend to think of freshness, wholeness, health and vitality. Let us rejuvenate your smile with a teeth whitening procedure. We can perform teeth whitening either as a comprehensive procedure or as a limited treatment-whichever your prefer. Teeth whitening or bleaching as it is often called, can provide exciting results. At your initial appointment, we can provide you with details of everything you need to know about starting the process of rejuvenating your smile. For patients who may already have restorations in their mouth, in which case, we can also replace the restorations to match your brand new color. The arches are usually bleached one at a time during the whitening treatment to ensure as close a color match as possible between the upper teeth and lower teeth. The surfaces of the teeth that are visible when you smile are the most important factor in owning the scintillating and sparkling ‘smile of your dreams!’ If you want to make heads turn with your exquisite pearly whites, make an appointment to see us. One of the most popular and effective developments in cosmetic dentistry, veneers are thin, custom-made casings that cover the front side of your teeth. Veneers are used to correct uneven teeth, worn enamel, discoloration, chipped teeth and irregular spacing. Veneers can give your teeth a more natural, aesthetically pleasing appearance and are stain resistant and soft on gums. In some cases, veneers can serve a restorative purpose and can protect a damaged tooth from further harm. Depending on the condition of your troublesome teeth, we will determine whether veneers are the most suitable answer to your problem as opposed to other dental fixtures. Dental porcelain veneers are by far the most sought after since they are eggshell then and have a brilliant translucent appearance just like a natural tooth. Other types of veneer include resin composite veneers. One of the newest and most exciting fields of modern dentistry is Implant Dentistry-a dental procedure that replaces missing teeth. If you have lost or missing teeth, you may wish to consider a dental implant. The reason that you have missing teeth, whether they’ve fallen out because of disease or injury, or needed to be surgically extracted, doesn’t really matter. What matters is that the structural integrity of your mouth be restored as well as your comfort and how you feel when you smile. With implants, you get advantages over traditional dentures that can help with all these things in a much more permanent way. 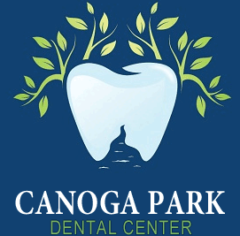 For the restoration of dental implants in Canoga Park, we will give you all the answers you need in a comfortable and inviting atmosphere. We have extensive experience in restoring dental implants with crowns, partial and full dentures. The information on this website is not intended to substitute for the counsel and expertise of a dentist. We encourage you to discuss any decisions about treatment or care with your dentist.